Health Benefits of Avocado for Kids. Children don’t always like to try new foods – especially the green, fresh kind. However, trying to entice your child to eat a more healthy diet comes with an array of benefits – kids become happier, more fulfilled and have an abundance of energy. Unfortunately, at some point, our children’s taste buds will head towards an array of dull, beige-coloured foods such as chips, nuggets and toasted soldiers, but it’s our job as parents to tempt their palette with more nutritious food choices (even, if it’s done, sneakily). Avocados are an ideal super food to try when you’re attempting to tantalise your little ones taste buds. This naturally nutrient-dense fruit contains an array of naturally good fats, which are essential for your child’s growth and development. It’s easy to present avocados appealingly to encourage children to eat them. You could add some cocoa powder, mash in a banana and whip it up into a yummy mousse, or make your own creamy dip. You could even pop some in a blender with some strawberries and milk and make a strawberry milkshake. Trying to get kids to eat healthily can become a bit of a challenge, but present the food right and you’re onto a winner! Avocados provide your child with the vital vitamins and minerals they need for their development. They come with an abundance of healthy fats – which are a great energy provider and help our bodies digest and absorb fat-soluble vitamins, like vitamin A, vitamin E, vitamin C, and vitamin B6. Avocados are ideal for improving digestion, encouraging regular toilet trips and relieving constipation. It may seem misleading, but despite their creamy, rich texture this wonder fruit is actually full of fibre. Getting your child to eat just one avocado a day will work as a mild laxative and help any uncomfortable toilet troubles. Is your child feeling sad, grumpy, anxious? Simply solution – feed them an avocado! Avocados have an infinite supply of good ‘mood-boosting’ fats. The healthy fats provided by this wonder fruit will keep your child feeling chirpy and cheerful throughout the day. Why? Because avocados are rich in tryptophan, vitamin B, and folate, combining these vitamins with healthy fats help to turn tryptophan into the feel-good hormone serotonin. When serotonin levels are raised in a child’s body feelings of happiness are created. Eating them boosts your immune system. Avocados are a true power house food; they provide a combination of essential vitamins and minerals (such as vitamin A, C, and E, Zinc and Iron), these nutrients are ideal for promoting immune health and supporting our body’s adrenal functions. Plus, as mentioned, avocados aid the absorption of other fat-soluble nutrients (found in food), which in-turn has a positive impact on our body’s immune system. Avocados are also a rich source of vitamin E and Zinc; vitamin E promotes a healthy antibody production which can help fight against an array of diseases. Zinc, on the other hand, assists in healing wounds but also supports the manufacture of white blood cells; which will help protect your child’s body from any nasty invaders. 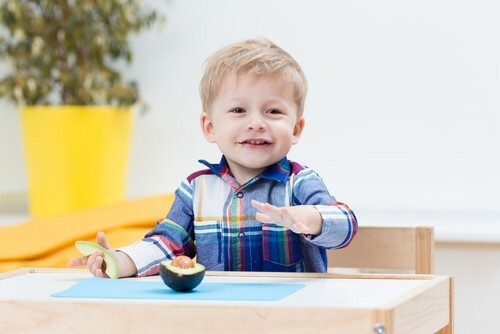 Avocados contain vitamin A, which plays an important part in a child’s development as it promotes healthy cell growth within their body – it also plays a significant role in supporting healthy bone growth and vision. This fantastic fruit is also enriched with calcium and potassium; which is essential for keeping our kid’s bones healthy. 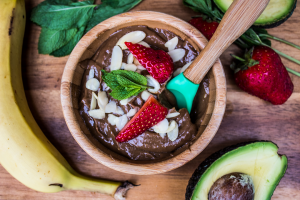 As you’ve just discovered there is a myriad of healthy fats and nutrients found in avocados – they’re so beneficial for the growth and development of our children. Place all the ingredients into a food processor and blend them into a smooth mixture. Keep the mousse chilled and serve it when desired. Mumma’s Tip: Place strawberries and chopped almonds on top for an even tastier pudding. Samantha’s new book ‘Mum’s Sneaky Recipes’ is a one-of-a-kind fully comprehensive guide to healthy eating in families. The first book of its kind to incorporate creative ways to smuggle fruit and vegetables into delicious meals for your children, while teaching little ones about healthy eating. This recipe book also aims to teach children in a fun and interactive way how to cook their own healthy, nutritious recipes in the kitchen.